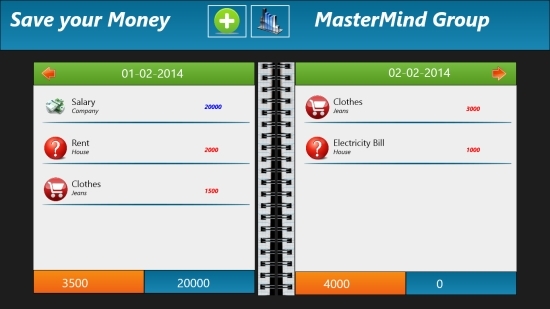 Save Your Money is a free Windows 8 expense manager that helps you manage your financial transactions in an easy way. If you are really tired of losing money because of lack of a proper budgeting system and wonder how you should manage it, just don’t worry. We have found a useful expense manager app to help you out. This free Windows 8 Expense Manager app is not only easy to use, but also very efficient in maintaining your budget book. You can record your incomes and expenses everyday in this app and review them anytime. The app also generates graph report of your transactions to make it easy to understand and analyse your expenses. Save Your Money is freely available in Productivity category of Windows Store. You can use the link given at the end to view the app directly in Windows Store, or search for it using Win + Q key combination. Let’s have a deeper look at this expense manager app. 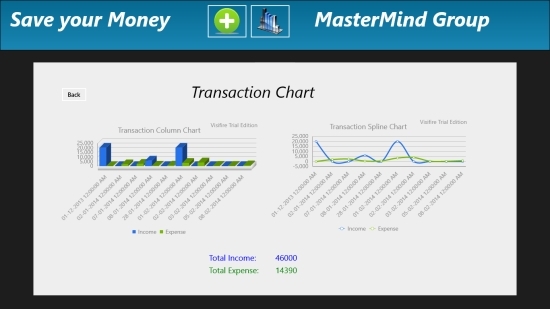 To manage your transactions using this free Windows 8 expense manager app, just install and launch it on your Windows 8 PC. As you land on the app’s Start screen, it will ask you to enter user name. You will also see an entry book with two page management style, the dates being displayed on the top of each page. You can enter your date wise transactions here. On top of the entry book, the icons for adding new transaction and transaction chart will be displayed. Tap on the icon for adding new transaction to add a transaction. A flyout will appear with options: Income and Expense. Click on the transaction type you want to enter. Fill in the required transaction details. The details include Expense, Amount, Date, Note, Category, and Account. You can fill the date using the dropdowns provided in the app. The app also provides dropdown for category option to let you assign a category to your expense like Salary, Food, Selling, Shopping, and other. Click on the right icon given on top of this sheet to confirm the details filled. That’s it! Your transaction is entered in the entry book and will be displayed, on the specified date. At the bottom of the sheet, the total of incomes and expenses for that specific date will be displayed. You can also edit or delete a transaction entry from the app. For this, switch to the particular date on which you want to edit or delete an entry. Click on the entry to open the details to edit. Click on the right icon again to save the entry back in the entry book. To delete a transaction entry from the app, click on the cross icon displayed on the top right corner of the page. You can close the transaction details page by clicking on the back arrow button displayed on the top left corner of the page. Use the left and right headed arrows on the top extremes of the two pages to navigate through the various pages. To see and analyse your transactions, you can refer to the graph reports generated by the app by clicking on the transaction chart icon given on top of the entry book. Also check out some other free expense tracker apps and some stock market apps we covered earlier. 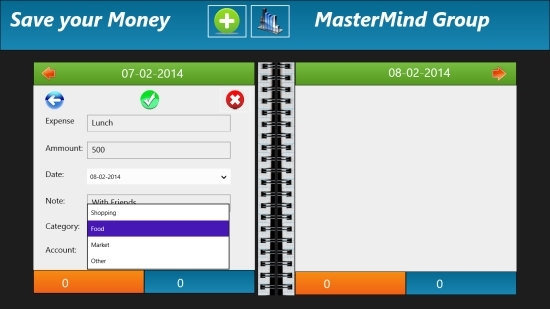 Save Your Money is a nice Windows 8 Expense Manager app that helps you manage your transactions by simply recording your incomes and expenses on daily basis. However, it would have been a better app if it had a few more functions. But, you can still give this app a try. Do share your feedback via comments. Get Save Your Money here!